Just How Dangerous Is It to Bike in the Bay Area? 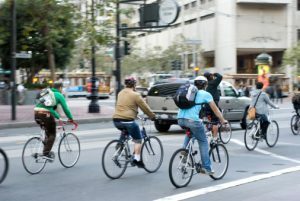 If you or someone you know has already been catastrophically hurt in a biking accident across San Francisco, you may be entitled to recover compensation for your lost wages, medical bills and other damages directly associated with the accident. An increasing number of victims have to file a personal injury claim against the party responsible for the accident in order to recover the compensation they need to put their lives back together. Consider that in 2012, California had the highest number of bicyclists killed in any state during that year. While cyclists only make up 2% of deaths caused by motor vehicles on a nationwide basis, in California they account for 4% of motor vehicle deaths. Far too often, motor vehicles are responsible for failing to look and to avoid accidents with cyclists. While many cyclists hopefully never have to experience road rage from a driver, even a driver who isn’t paying attention or who isn’t giving you enough attention as a cyclist can put you in danger of losing your life. Distracted drivers, tired drivers and texting drivers can all cause you serious harm when you encounter them on the road even if you have done everything possible to enhance your own safety. This is why it is so critical for a cyclist to follow the rules of the road, to be visible and to always communicate clearly when drivers are around them. Many cities are becoming much more aware of cyclists but unfortunately, far too many accidents still happen. The vast majority of these cycling accidents across San Francisco could be avoided completely. Consider just how many people have been struck in a dooring accident. A dooring accident occurs when a bicyclist is in the bike lane or near the sidewalk when someone throws open the door of their vehicle. This could lead to catastrophic injuries for the cyclist if he or she is struck and thrown into oncoming traffic. Consider that as few as 10% of bicycle accident injuries are ever reported to the police. Many bicyclists assume that they have no rights and simply try to pick themselves up and move on after a crash, but this can be a big mistake because some of the most severe injuries can be shielded by the adrenaline and shock of going through the accident. That’s why it’s a better idea to get medical attention just in case and to proceed with the help of a personal injury lawyer.